( 3/16/17 Please note: Our Program guidelines have changed, please read before purchasing. To purchase a class, product, or service, please go to this page! 1. No refunds, no exceptions. 2. All readings are paid for in advance using the Paypal payment buttons. This provides verification of the service you have paid for by Spirit Blossoms Psychics. 3. The reader or representative of Spirit Blossoms Psychics has and maintains the right to end the call or service without the possibility of a refund..
4. Aggressive language, inappropriate sexual language, or anything deemed inappropriate by Spirit Blossoms Psychics (In email, voice consultation, skype or facetime reading, skype or any time of reading), the service will be terminated without a refund, no exceptions. 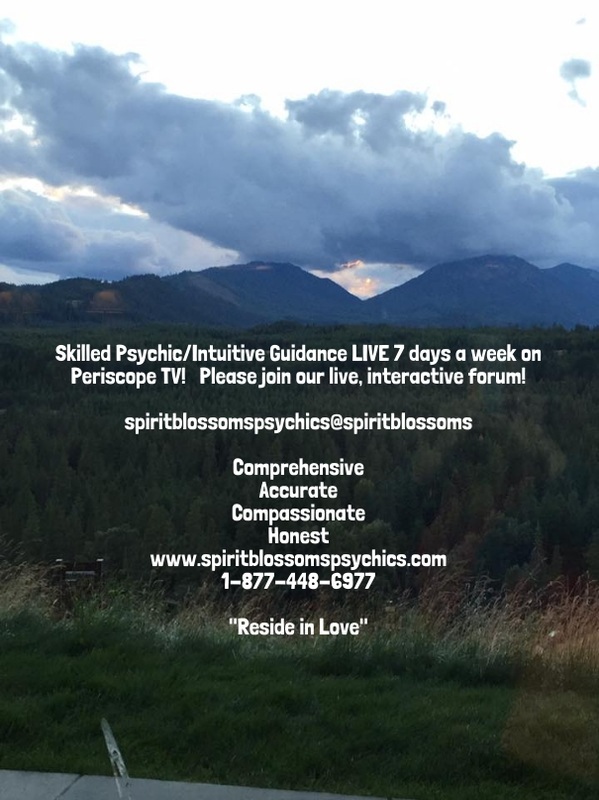 Spirit Blossoms Psychics is pleased to present a 6 week live broadcast series! Every Saturday, join us for an hour's installment. $20 donation prepaid per session of $25 donation the day of the live feed. You can download the Periscope app to your phone! Look for "Periscope Live Video" in the app section of your smart phone. It is a free app. "How to Break Free of a Narcissistic Relationship: A Survivor's primer"
In this 6 week course, we will look at what a narcissist is by definition and traits, how to survive day-to-day in as the narcissist's supply, how to create the strategy to leave, and how to reclaim you life after the break up. In our 45 years of working with clients, and having a window into life with a narcissist, whether covert or malignant, I have had the pleasure of seeing hundreds of men and women break free of these toxic pairings and successfully rebuild their lives. Please join us Saturday's starting 4/7/18 at 4:00 p.m. PDT via Periscope TV. More details to follow! I look forward to connecting with you soon. PSYCHIC SUPPORT PROGRAM, PAY FOR YOUR MONTH OF GUIDANCE AHEAD AND GET VIP SCHEDULING! Psychic Support Program offers you 2 hours of readings and intuitive guidance (mediumship, distance healing, past life regression, and email readings not included). Please note, leftover minutes do not roll over into the next month. Reiki One, Two, Three, and Master Teacher Level! Learn how Reiki or Universal Life Force Energy can change your life! You will be attuned to each level and also cultivate your intuitive and psychic gifts. We work with the meridian systems of the body and you become a clear and healing channel. Razzi received her Reiki attunements, training, and certifications from The Reiki Training Program: The ONLY vocational school for Reiki in the United States. She is a member of the Reiki Fellowship. Reiki was re-discovered by Dr. Mikao Usui in Japan in the 1800's, and is a gentle healing system that can be used hands on the body, around the body (auric field), and in distance healing. It is often combined with sound healing and Shamanic practices. Tarot Courses are broken into segments of 2 hours each. Razzi Lentz, the founder of Spirit Blossoms Psychics, a reader of 44 years will guide you through this ancient system of Divination! Tarot Module 5: Interpreting the Tarot Cards in a reading as a whole and learning the traditional spreads. Spiritual Mentorship or Coaching is $100 - $400 per month (or 1 - 4 times per month!). Each session is to 2 hours in duration. Versatile Life Tools, or as my students have described them, "Razzi's Secret Sauce!" Leaning the power of YOU! Your life is now, and there is no reason to struggle and remain in the same place, with the same lessons swirling around you. This program is designed to get you off the hamster wheel reconnected to your success, joy, abundance, and balance. You have the capacity to rise above any of life's challenging situations, it is simply a matter of stopping the patterns that do not serve you and plugging in new programming. Let us work together to bring your life into clear focus. ALL SALES ARE FINAL. NO REFUNDS, NO EXCEPTIONS. ALL SESSIONS ARE PREPAID.